If you attend addiction recovery meetings such as the 12-step groups, there will usually be no pressure on you to say anything. You could be one of those people who come after the meeting starts, says nothing, and leaves right before the end. It is possible to regularly attend fellowship meetings and never say a word, but this will mean that you would be missing out. It is understandable that you may initially feel a little intimated by sharing at one of these meetings. Maybe you are naturally introverted or shy. The reality is that most of the people there are going to be feeling the same way. You do not have to talk for long to enjoy the benefit of sharing – even if you just say ‘hello’ it will be better than nothing at all; and it will break the ice. If your problems are just allowed to bang around inside of your head, these end up feeling a lot bigger than they actually are. This is because whatever you are dealing with is likely to be blown out of proportion due to negative thinking. The mind can go into panic mood, making it very hard to see things in perspective. One great point about sharing your problems is that things do not feel half as bad after you have talked about them. Even if the other person cannot offer any practical advice, things can still feel far more manageable because they are now out in the open. Sharing at a meeting can mean that you get to see your problems in a completely new way. You can be speaking and then suddenly the solution becomes obvious, or you see a new perspective on things that you had not thought of before. It is as if the act of sharing somehow opens up doors in your mind that would otherwise be locked. Cross talking is discouraged in meetings, but there may be individuals in the group who are able to offer you some practical advice regarding your problem. These ideas may be suggested when other people share, or you may have people coming up to you after the meeting – this is why it is a good idea not to just rush off at the end. You may have a few individuals willing to go for a coffee afterwards, which can give you the opportunity to really dig down into your problem; getting a new perspective on things can be a huge help. If you never share at the meetings, you are always going to feel like a bit of an outsider. Even if you only feel like sharing a few words, it will make a huge difference to your comfort levels within the group. Sometimes you just might not have anything that you want to share, but there is no reason why you can’t just let others know that you are doing okay; in fact, this can be just as important as sharing your problems. Sharing is the way that others get to know you and it is a good way to begin building a network of sober friends. One of the main reasons why you are likely to feel better after you have shared is that it means you will have been able to let off some steam. You may enter a meeting fuming and ready to snap at the first person who looks at you the wrong way, but there is usually a real sense of release after you have managed to get everything off your chest; don’t be surprised if you find yourself laughing about the situation even before you have finished sharing. The ability to let of steam is vital in recovery, which is what happens when you talk at meetings. Those who regularly share at fellowship meetings are less likely to relapse than those who just drift in and out without saying a word. This is because sharing gives you strength, which can make you feel more committed to sobriety. It is very easy to end up off-track in recovery without even realising it. This is worrying because it could mean that you are moving closer to relapse. One of the benefits of sharing at meetings is that it means you will be able to get some feedback. This could mean that others may perhaps warn you that there is a potential danger ahead, which can put you on your guard. If you do not have a sponsor who you share with on a regular basis, it is even more important that you share at meetings. One of the benefits of sharing your problems in a group such as this is that it can be of great value to others who are listening. At the very least, it can let them know that they are not alone. You could say something that could completely change another person’s life. 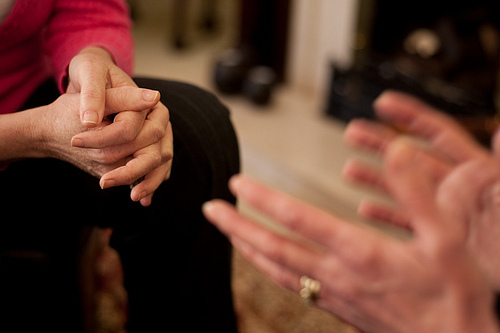 Newcomers especially can benefit from hearing your honest thoughts about life in recovery. Groups such as Alcoholics Anonymous would not exist if it were not for the fact that there are people willing to share. This can be considered a type of service as you are making the meetings possible. Even if you only say a few words, it will mean you are giving something back. Of course, sometimes not sharing could be a type of service as well; this would be the case if the meeting was busy and you decided not to speak to give newcomers the chance to say something (although you should only really do this when you do not have anything important to say). Problems in life will always be more powerful when they have you isolated and unsupported. This is why people who fall into addiction often start to withdraw from the world. By sharing your problem, you no longer feel alone. There may be others in the group who have had to deal with the same situation – at the very least, there should be at least someone who has dealt with something similar. Talking about your problems at a fellowship meeting is likely to lead to more clarity. The fact that you are trying to explain things to others forces you to think in a different way and it can mean that something that felt incredibly complicated while it was banging around in your head can suddenly seem straightforward. Going to a recovery meeting is usually a good idea, but your actual participation will mean you get more out of this activity. It is all about making the best use of your time. If you go to a meeting and do not share, you will likely not have benefited as much as you could have from the experience.